1. The boys were so excited to get out a few Halloween decorations that I bought last year, when Halloween decorations were on 90% clearance. In addition to a haunted hedge and a purple light spider web, we have menacing ghosts peeking out the window of our front door. 2. I had to fling a snake the other day. Not sure what kind it was - I tried to look it up via Google but couldn't find anything similar. It was black with large beige spots. A young snake, it was in the middle of the trail I was running repeats on, and would not move. I was afraid one repeat I'd miss it and stomp on it or get bitten. So I used a stick to fling it off into the pasture. I had chill bumps afterwards. 3. We lost our sweet guinea, Tut. He got taken out one night in his tree - perhaps a hawk or owl? I will miss his curious nature - he was always peeking in the windows at us. 4. Sometimes people ask me how I am motivated to exercise all the time. Here's a little trick. When I am so busy that I have to wake up early to run before the boys get up, I set the radio alarm to a country music station. I loathe country music. I hear that twangy singing and I can't take it. I have to get up to shut it off! And once I'm up, well, might as well go run. 5. My first ever craft fair is tomorrow. Fingers crossed for nice weather (it's outdoors) and people who love my wares! Linked today with Nancy's Random Friday. Snakes on the trail give me the shivers. I've seen two recently and that's very rare....not since I was dating that girl where every place we went there was a snake. Talk about omens! Old Tut, he had a long life and did enjoy peeping in windows. They are saying clouds tomorrow morning so maybe you will have a good day. LOL.. I need to exercise more, and I doubt the country music trick will work, even though I feel the same way you do. Good luck at the show!.. and I love your door. That looks really cool. 1st question always would be - what color was his tip of the tail? a little bit of green ... you have a baby copperhead. the ones i dislike big time. i have seen an adult & a baby this year. & i am not so not their friend. i can handle black snakes but i don't really like them. or want them around ... i know they live but could they live not on my property, please. i beg, please! Country music that is funny. I have my fingers crossed, but I think you will do well! AW :( so sorry about Tut . It's cool that you can fling snakes , I mean if you have to . Those door ghosties are fun. YOU are gonna do GREAT at the fair. oh i'm so sorry about tut :( love your ghosts...i need to pull our stuff out, i keep forgetting! good luck at the fair and i am lol'ing at your motivation trick! Where is the craft fair??? love those ghosts. yuck on the snake brave lady! good luck at the fair -- you'll do fine. i laughed out loud at the country music! sorry about Tut. have a fun weekend. Spooky! I love it. And good luck at your fair. I used to do those. I'd be scared coming to your house, but still what fantastic decorations and 90% off WOW! You'll have a great Fair day rain or shine, I just know it but it was sad to read about Tut...dang Nature sometimes. good luck from here for tomorrow!! do well and have fun. just laughing at the country music alarm! the ghosts are too scary for me. sorry about the guinea! and good luck w/ the craft fair! So sorry about your sweet guinea! Hope you do well at the craft fair. From what you've shown us here, you should be a big hit! Good luck w/the craft fair! LOL at the country music trick. And ewww about the snake!! I'm sorry about your sweet Tut. Sad. I feel the same way about country music. Blech for sure! And you will rock the craft fair!! I LOVE the ghosts on the door! I had chill bumps just thinking of you flinging that snake!!! yikes! Good luck with the craft fair. Snakes and ghosts too scary. Well, the snake anyway. Sorry about Tut. I wish you well at the craft fair. Have a great weekend. Poor Tut. We all have to go sometime, I guess. I used to kill snakes. I hate them. But my daughter forbid the slaying of non poisonous snakes, so they are safe from me now. Not the rattlers and copperheads, though. Good luck with your craft fair booth- I hope you sell out! I don't jive well with country either..and most would be surprised if they could hear my exercise music..it's all about the beat! I'm no fan of snakes, either, Lisa. Kudos to you for staying with the fitness program of running. Have a nice weekend! 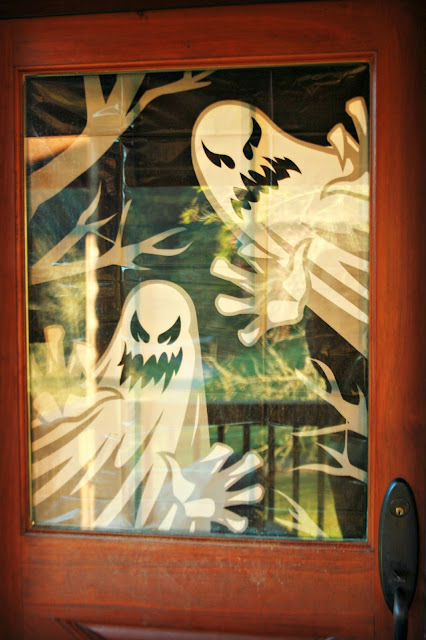 Great door ghosties! Good luck at the fair! So sorry about Tut. At least he had a good life while he was with you guys! Hope you can get another one (or more) in the future. Your exercise trick cracked me up. Maybe I should give that a try. Good luck at your craft fair! Awww, so sorry about Tut. Guineas do grow on you. We are down to one now and I'll be sorry if/when he's gone. Very pretty door and cute Halloween decorations. Hope you have good success with the craft fair. Taking time away while John is sick. I love the decoration. But it make my daughter screaming. Snakes are very frightened one. Your halloween image looks great. Very sad for your TUT. Hoping today's event is wonderful and profitable for you. not crazy about snakes any time or anywhere but think you're a wise woman in how you motivate yourself to exercise. might have to use that tip. our last storm brought in 6 guinea's but only three are still here. they've moved from the road to the barn to the yard; guess I'm going to buy chicken scratch this winter 'cause I hate for stuff to go hungry. wishing you huge success with the craft fair; hope you did well. Oh I am sorry about Tut. Too funny about the twangy music! But I'm sorry to hear about the guinea. I love this post! You are a hoot. Country Music, I know what you mean!!! I try to work out 30 minutes every morning, but I am retired and, therefore, gainfully unemployed!!! My daughter gets up at 5 to go to a fitness group once a week. I'm proud of her! Hope you did well at the Craft Fair. I'll bet that you DID... Hope the weather is as nice there as it is here. Halloween is such a neat time of year--especially for kids and decorations. Oh, I hope you did well at the sale, Lisa! I'm so sorry about Tut. That must have been so sweet for him to look into the windows. So sad about your guinea. :( I would not make a good country gal--that would make me cry. My daughter lived for a time in a house that was occupied by a restless spirit. She actually did see it, though the daughter of her housemate was the one who had the best contact. It's the kind of thing which could make people a bit snaky. You are a snake flinger...and that makes me giggle. Your poor Guinea pig. So, he was outside? I know nothing about those little critters....I thought they had to be locked up like gerbils. The ghosts on your doors are really cute; I'm sure the boys are in heaven with all the décor. I hope the craft fair rocked!